Carlos Ochoa — legendary potato breeder, explorer and scholar — has passed away at an age of 79 in Lima, Peru. Born in Cusco, Peru, Ochoa received degrees from the Universidad San Simon, Cochabamba, Bolivia and from the University of Minnesota, USA. For a long time Ochoa worked as a potato breeder. He combined Peruvian with European and American potatoes to produce new cultivars that are grown throughout Peru. 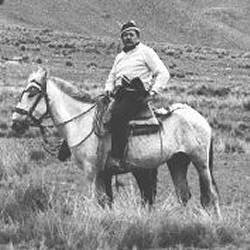 Ochoa was professor emeritus of the Universidad Nacional Agraria La Molina, Peru. In 1971, he joined the International Potato Center, where he worked on the systematics of Andean cultivated and wild potatoes. His long list of publications on this topic include hefty monographs on the potatoes of Bolivia and on the wild potatoes of Peru. His last major published work (2006) is a book on the ethnobotany of Peru, co-authored with Donald Ugent. Ochoa was a wild potato explorer par excellence. One third of the nearly 200 wild potato species were first described by him. Carlos Ochoa received many international accolades, including Distinguished Economic Botanist, the William Brown award for Plant Genetic Resources, and, together with long time collaborator Alberto Salas, the Order of Merit of the Diplomatic Service of Peru. Here is Ochoa’s own story about some of his early work, including his search for Chilean potatoes described by Darwin and his thoughts on potato varieties: “[they] are like children: you name them, and in turn, they give you a great deal of satisfaction”. Not long ago (September 6th, 2007) I received the sad news of Prof. J. Hawkes dead. With the death of C. Ochoa, the science in general and the PGR community in particular are poorer. Let’s not forget their lessons and lets keep the flame alive. Now, more than ever, biodiversity conservation needs the help of us all. The Herbario Nacional de Bolivia (LPB) never will forget Carlos Ochoa: His collections at LPB will remind us for ever. Carlos, thanks a lot what you have done for Bolivia and to call my attention to the future of botanical collections at LPB.